Arun Ramkissoon is very familiar with osteoarthritis, one of the most common forms of arthritis in the world. 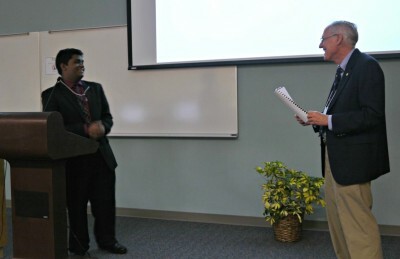 Arun Ramkissoon (left) answers a question from SRI Program Director Charles Bigger (right) during the mini-symposium presentation. The condition, which causes the degeneration of joint cartilage and underlying bone, affects around 15 percent of the world’s population – including his grandparents. This summer at FIU, Ramkissoon had a chance to be part of research to help develop a treatment for the condition using tissue engineering, research that could help benefit millions of people who have osteoarthritis. The thing is, he isn’t even in college yet. Ramkissoon was one of 29 high school students from MAST Academy and TERRA Institute who completed the Summer Research Internship program, which offers high school students the opportunity to engage in cutting edge scientific research being conducted in FIU laboratories under the mentorship of top scientists. The students, who were involved in a wide variety of different scientific areas that include computer science, environmental issues and biomedical engineering among others, concluded their eight-week program with a mini-symposium on Aug. 9, delivering presentations on the research they’ve been a part of throughout the summer. But the research doesn’t end here. A number of the students, including Ramkissoon, are looking for ways to continue the work they started at FIU in the fall, asking if it would be possible to come and work alongside faculty and FIU students after school. Being a part of the program has helped open their eyes to the significance of conducting scientific research. And students are not just performing menial tasks to collect community service hours; they are active members of the research team they are involved with on campus. Not only are students getting valuable experience in the research lab, but they are also getting a taste of what college will be like, attending workshops designed to help prepare them for life after high school. “They’re getting exposed to college life and they’ll be way ahead of the game when they graduate whether they come to FIU or another institution,” said Program Coordinator Amy Reid. The chance to work in a lab and also have a professional mentor has been invaluable for the students who participated in the program, giving them a chance to get a first-hand look of what it takes to have a career in the scientific field. Karla Montejo, who plans to attend FIU this fall to study biology after graduating from TERRA Institute, found a mentor working under Dr. Lidia Kos of the Department of Biological Sciences for two summers. Currently, the program is completely volunteer-based, with FIU faculty and staff donating their time and research to the program. The students chosen to participate are part of the program at no charge. Associate professor Mehmet Dorak, who mentored Jazmine Gladney on a research project involving a search for genetic causes in childhood leukemia, has been involved with the program from the beginning and has enjoyed having the opportunity to work with potential researchers. Eventually, Reid and Bigger would like to see the program grow and expand to welcome a wider group of potential high school students since they have seen a huge demand from schools around South Florida. But for now, they are focused on providing a quality experience with the resources currently available to them. They also believe this program serves as an opportunity to attract women and minorities into careers in scientific research. For more information on the Summer Research Internship, go to http://mbrs.fiu.edu/gallery/aboutsri.shtml.